CPF Fittings and Hose are a new line of quick-test pressure fittings for calibration and test applications -- designed with an emphasis on safety. 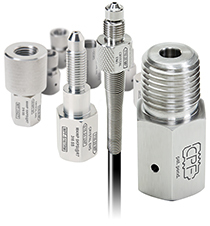 Crystal Pressure Fittings (CPF) perform up to 15 000 psi / 1000 bar, and feature a safety weep hole to alert you before you accidentally disconnect from a pressurized system. It can also be used as a bleed point. New! We have added a new line of BSP fittings, including the industry's first 1000 bar finger-tight fitting. ** Autoclave Engineers is a division of Parker Hannifin Corp.